Musical Ecologies continues on Thursday April 11 with Brooklyn-based composer Zach Layton who will present a new work for string quartet and bowed electric guitar entitled Stridulitrum. Performed by Alex Waterman (cello), Amy Cimini (viola), Eli Spindel (violin), Laura Ortman (violin) and the composer (bowed electric guitar), the work is inspired by a study of the sound production process used by many insects involving the scraping together of different body parts, typically legs or wings. The mechanism, know as stridulation, is best known in crickets and grasshoppers, but other insects include Curculionidae, Cerambycidae, Mutillidae, Reduviidae, Buprestidae,Hydrophilidae, Cicindelinae, Scarabaeidae, Glaresidae, Passalidae, Geotrupidae, Alydidae, Miridae, Corixi. 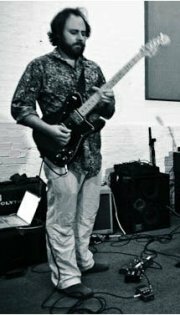 Zach Layton is a guitarist, composer, curator, improviser, teacher and video artist based in Brooklyn. His work investigates unconscious autonomic musical impulses via improvisation and indeterminacy. Using an EEG which can monitor brainwave signal in realtime, he is able to sonify and visualize this stream of unconscious data. His music involves a combination of digital and analog processes, field recordings and electric guitar played in non-standard tunings. He has performed and exhibited at the Kitchen, ISSUE Project Room, Roulette, Diapason, PS1/MoMa, Anthology Film Archives, Performa, Exit Art, Transmediale Berlin, Audio Art Festival Krakow and many other spaces in New York, South America and Europe. Zach is also founder of the acclaimed experimental music series, “Darmstadt: Classics of the Avant Garde” (co-curated with Nick Hallett), and former co-curator of the PS1/MoMa warmup music series and of Issue Project Room. A graduate of Oberlin, NYU and Bard College, he is currently an assistant professor of music theory at Bloomfield College and Music Supervisor for the upcoming 3D dance film, Cunningham. Upcoming on Musical Ecologies: Jason Cady 5/16; TBA (6/13). Comments closed — Trackbacks closed RSS 2.0 feed for these comments This entry (permalink) was posted on Thursday, March 21, 2013, at 3:30 pm by Dan Joseph. Filed in press release.